Mom, Elise, Eloise and I are heading back to Indie Wed in a few short weeks! We had such an amazing time last year and collected a few goodies. I think Elise found some wedding inspiration last time, but now that her wedding is only eight months out, she might be on more of a hunt. Who is joining us? Here are my summary posts from last year. This year, they added Bride and Groom Lounges, staffed by local salons. I am very curious to see what this is about! I am also looking forward to getting to know a few vendors. Dressmaker Lindee Daniel looks interesting. She is a green vendor, creating flowing and unique gowns from sustainable materials. Her site is still under construction, but I found a few photos from her show for New York Bridal Week. 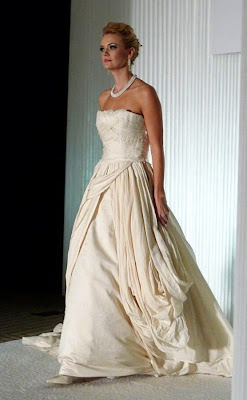 I love the style of the wedding gown from Delightfully Engaged very classy & elegant.